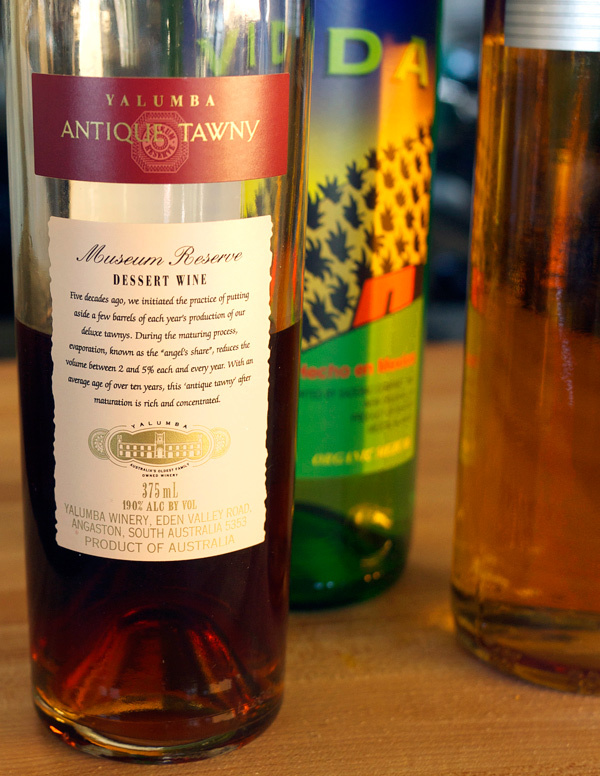 For this month’s Mixology Monday, I found myself with an already half-concocted recipe I could leap off with for January’s theme of “Fortified Wines”. Which was great, because I’ve already given up on resolutions and have been spending my time waiting for the temps to rise nursing Hot Toddies to my heart’s content not posting on here and needed an already running start. Hosted this time around by Jordan Devereaux of Chemistry of the Cocktail, he’s asked us to try our hands at mixing fortified wines (sherry, port, etc…) into a cocktail. I usually enjoy a glass of Port by itself, but have yet to delve very far into trying much else with them. After reading through the PDT Cocktail Book lately, I noticed a few drinks calling for Port and Sherry as an ingredient. This piqued my interest and spawned an earlier version of this cocktail. Needing some guidance for proportions, the end result, Smoke on the Vine, is a variation on the La Perla cocktail (a tequila and sherry base that I subbed out Mezcal and a Tawny Port for). This particular cocktail project also helped make Twitter useful for me. Last month, I got so busy with Holiday crap that I forgot all about checking websites and missed the last assignment. This month I changed my settings to get an alert whenever the MxMo account tweets, which thankfully is not every 30 minutes. Now I can just let my phone remind me about such things. Fill a mixing glass 2/3 with ice, add all ingredients except for garnish. Stir and strain into a chilled cocktail glass or coupe. Twist the lemon peel over the drink, expelling the oil into it and drop the peel in. 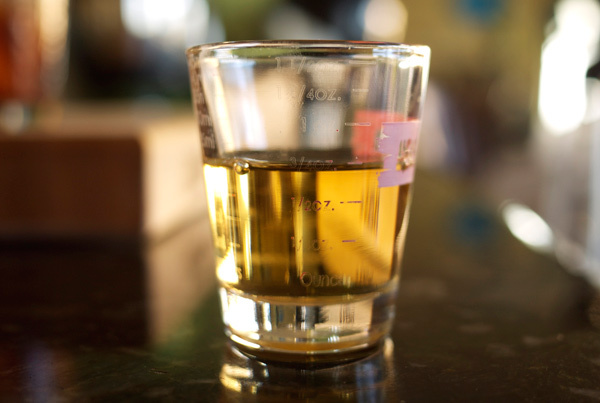 Mezcal sometimes needs a strong companion in a drink, otherwise it will dominate the palate, your nose, and anything else it comes into contact with. Dividing the main stars of the drink up 50/50, the Port provides a syrupy sweetness that balances well with the savory nature of the Vida. It also gives the drink a nice, rich mouthfeel. Adding a touch of acidity and your first hit on the nose, the lemon oil and lemon peel are more than just a garnish. 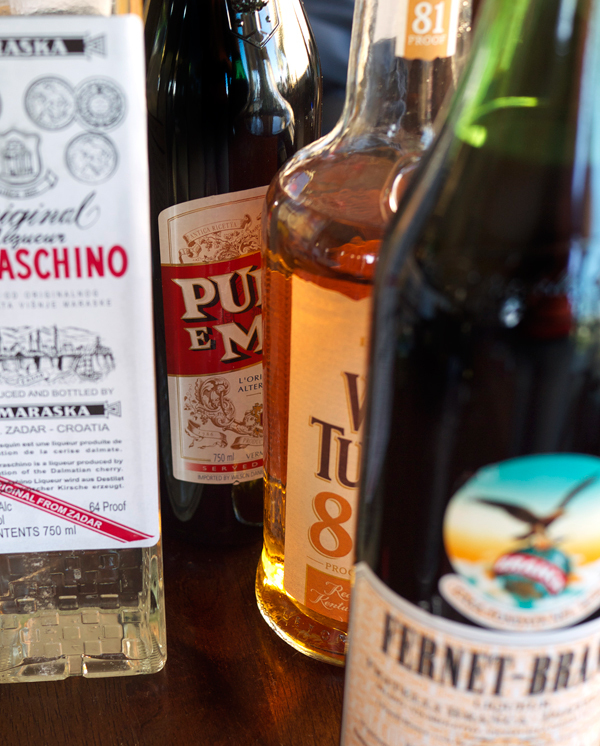 Opting for a wide open glass, your nose will sink into that lingering lemon oil mixed with the strong hit of mezcal, punching everything up until you sip into the sweet layer of Port. And that Apricot liqueur! I’m putting it in all kinds of drinks lately. Notes of cumin and wood, as well as a necessary dryness provides that last balancing act for this cocktail to work. The bitters, while just barely there, I found cut the sweetness back by just the right amount (earlier takes of this drink, while pleasant, tipped a bit too much to the sweet side making the drink sit flat). Now I can pat myself on the back for getting this done and get back to business on here thanks to the MxMo gang. Here’s the round up post of everyone’s drinks from this month’s MxMo! 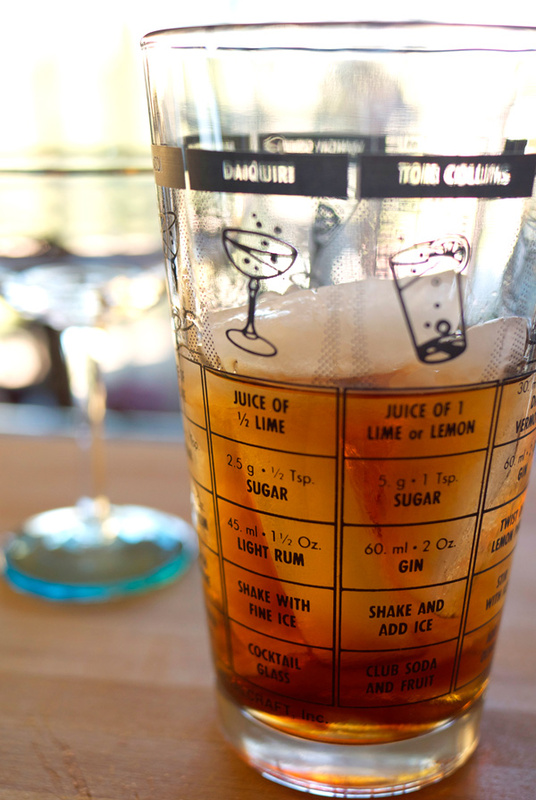 Read through any cocktail book and there are more recipes that start with ‘this is a variation on…’ then one realizes. Mad scientists behind the bar, a mixologist/bartender/whathaveyou finds themselves looking at a base recipe and seeing where it can take off. 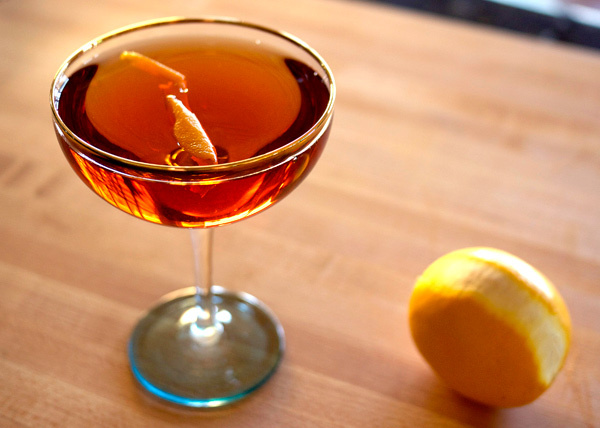 This cocktail recipe is a riff, on a take, on a variation with its beginnings at the turn of the 20th century. To explain further, the PDT Cocktail Book does a great job of briefly setting up some ingredients and ideas for seasonal cocktails, and in the ‘Fall’ category use the Newark as an example of a cocktail that lends itself well to multiple variations. The drink itself is based on the Brooklyn cocktail. So I went with my own variation, and named it after my neighborhood. Well, sort of my neighborhood. My actual neighborhood is so small that even people living in it don’t necessarily know it’s technically separate from Eagle Rock, or Glendale. So I’m naming it the Eagle Rock. (Apologies to everyone not in Los Angeles, for which this makes no sense. Now would be a fun time to go look at Google maps, or just continue reading). Pour ingredients into a mixing glass 2/3 filled with ice. Stir and strain into a chilled coupe. 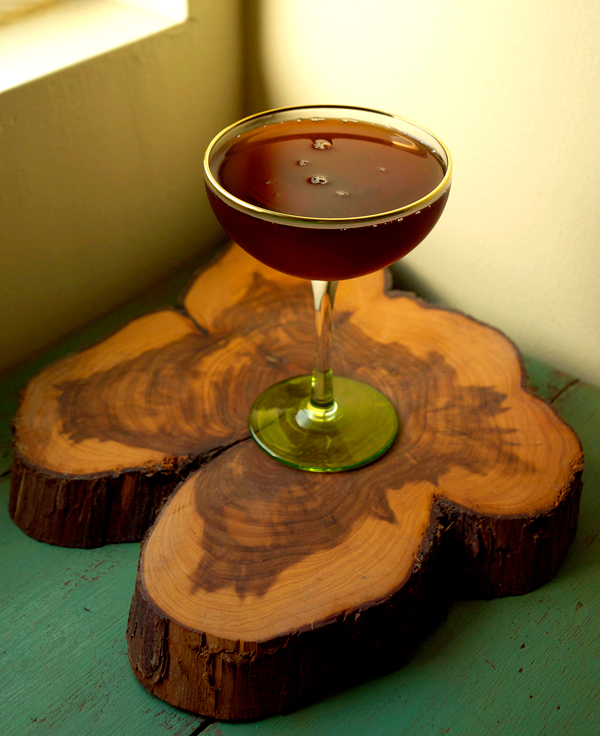 The combination of Punt e Mes and Fernet Branca made me think of a more herbal variation on a Manhattan. The drink is dry, sharp and bitter with some sweetness from the Maraska and Punt e Mes, and a strong herbal undertone. And why the Wild Turkey Bourbon? It’s what I had on hand, and it added a nice layer of spice too. The hard ciders and Glogg are starting to roll out. It’s Fall- hell, it’s almost Thanksgiving already. For me that means starting to plan for Christmas. My personality is such that I painfully start planning things much too far in advance, forget about them, and freak out at the last minute trying to get these plans into action. A good chunk of gift giving is pretty easy actually when it comes to my friends. They all like booze. But really, putting a bow on a bottle of Jameson a couple years in a row starts to become too easy and predictable. Yes, you can step it up and maybe shell out for a bottle of Booker’s. However that becomes expensive when you multiply that by just 4 people. When I started making my own infused syrups at home it occurred to me the potential these had for gift giving. 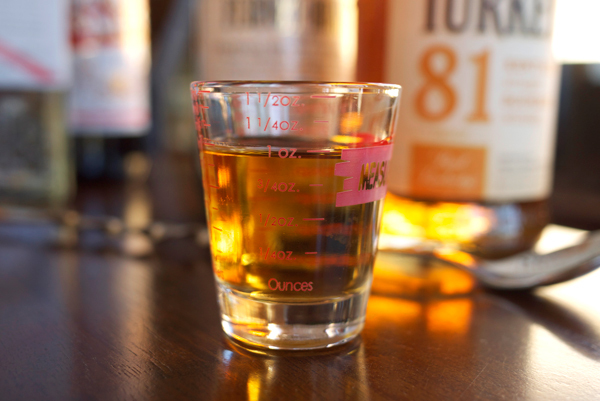 One can make up a batch, pair it with a small bottle of something, and write up a little card with a drink recipe on it. For me, it’s a way of sharing an interest with my friends and getting them tipsy in the process. Win! Even better when you can open it together. This year I’m expanding my usual arsenal of syrups to include some Fall spices that I want to try out. Adapting the clove syrup recipe from the PDT Cocktail Book , I’ve scaled that down and also worked up a cinnamon syrup too. Bottle these up and give away, or keep for yourself. For this recipe, I made a master batch of simple syrup and then divided it to steep the cloves and cinnamon separately. Combine water and sugar in a sauce pan. Swirl to combine and place over high heat until warmed through and transparent. Do not let it come to a boil. Once sugar is dissolved, remove from heat if using immediately for below or keep over a very low flame- you will need the syrup to be warm to infuse. 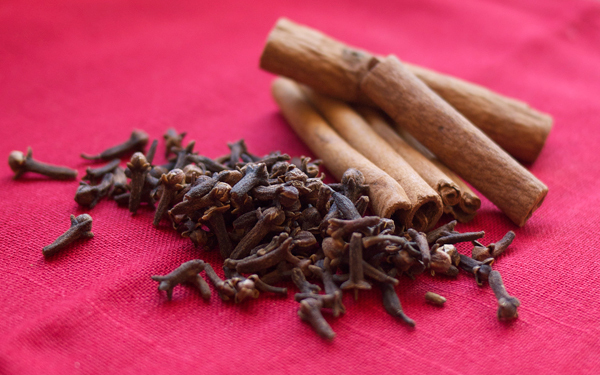 Combine a half cup of the warm simple syrup with the cloves in a heat-proof container. Let sit for 15 minutes. Strain into a bottle through cheesecloth or a fine sieve. Let the mixture cool and store in the refrigerator. Combine a half cup of the warm simple syrup with the cinnamon sticks in a heat-proof container. Let sit for 15 minutes. Strain into a bottle. Let the mixture cool and store in the refrigerator. Syrups will keep approximately 1 month in the refrigerator (or at least they do in my house).